I’ll admit it. I’ve never been a big fan of tomato sauce. I think it’s, well, boring. Yet, sometimes, it definitely has a place in the kitchen. In a lasagna for example. Or, most recently, on pizzas cooked on the grill. But, generally, I end up in the same situation I’m in now: with a jar of tomato sauce in the fridge and no inspiring plans on how to finish it. This is where just a tiny bit of vision can elevate a blah dinner into something noteworthy. Before I share a few ideas with you, and beg for yours, a word on the sauce itself. It’s easy to argue that tomato sauce is boring only if it’s not good. Fair enough. But my tomato sauce IS good. Right now, it’s good because Mario Batali made it and put it in a jar for me. (Well, not exactly, but I’m standing by my endorsement that the Batali line of sauces are, in fact, the best I’ve ever had. Head and shoulders above the rest.) Other times it is good because I use this super-simple 101 Cookbooks recipe. It’s an easy and obvious choice. Top pasta with tomato sauce with fresh mozzarella and sliced basil for a quick but simply elegant dish. Best bet for pasta is a fresh linguine. If your tomato sauce isn’t of the “chunky” variety, consider adding half a can of roasted tomatoes while you simmer the sauce for a more interesting texture. A tubular pasta like Rigatoni works nicely with a bright tomato sauce that is enhanced with eggplant, cherry tomatoes, fresh mint and ricotta salata. While you cook the pasta and reheat the tomato sauce, heat a skillet, add a little olive oil, garlic slices and cubed eggplant. (Buy a smaller variety to eliminate the possibility of bitterness.) Combine and top the dish with grated ricotta salata (or substitute Parmesean if you can’t find the aforementioned), halved grape or cherry tomatoes and fresh mint leaves. Add a little Mediterranean-style zing to simple pasta and tomato sauce with the addition of chopped Spanish olives, capers and a dash of lemon zest. 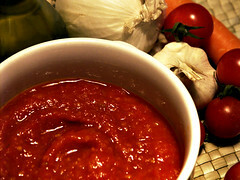 Just toss the additions in with your tomato sauce while it simmers and then mix with linguine or fettuccine. I mentioned my love of lasagna. For a similar dish in a hurry, heat your oven to 400 degrees, cook some ziti, heat a pan and cook a little onion and ground meat substitute while you reheat a little tomato sauce. When the pasta’s done, mix with the meat mixture, tomato sauce and fresh spinach (stems removed) and a bit of fresh ricotta. Fill ramekins with the pasta mix, top with a sprinkling of mozzarella and Parmesan and bake until the cheese melts. Now I need your help. There’s really a LOT of pasta sauce in my fridge…and generally in life. What are some of your favorite ways to use it? I love using pasta sauce as a base for minestrone soup. I am also a fan of embellishing my store-bought pasta sauce with mushrooms and extra veggies. I love the stuff! Great ideas! But I love mushrooms in anything.